Another year is drawing to a close, and Fantasy Flight Games would like to thank each and every one of you for helping to make 2017 another wonderful year of games. We saw the release of massive new games, ranging from Twilight Imperium Fourth Edition, to Legend of the Five Rings: The Card Game, to Runewars Miniatures Game, and we’re incredibly grateful to our wonderful partners and to you, our loyal fans. A brand-new year is right around the corner, and you can be certain that even more amazing games are waiting to be revealed in 2018! In honor of the holidays, the Fantasy Flight Games and Asmodee North America offices will be closed December 22nd for Christmas Eve, as well as Christmas Day and New Year’s Day. Then, we’ll all return to the office on January 2nd to start a full new year of gaming with you! We’re wishing you all the best in this holiday season. Thank you for an unforgettable 2017, and we can’t wait for you to join us in an even better 2018! 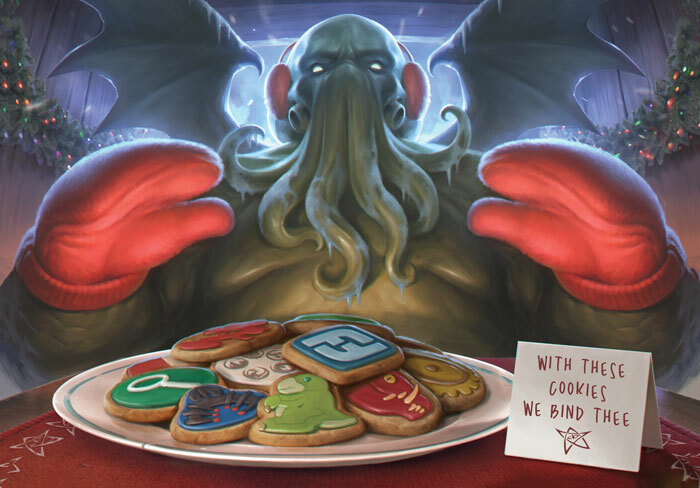 Happy Holidays from your friends at Fantasy Flight Games! Thank you for a wonderful 2017—we can't wait for an even better 2018.